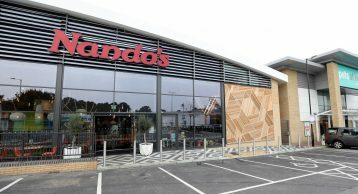 3,218 sq ft space at South Aylesford Retail Park in Maidstone has been occupied by an international casual dining restaurant chain Nando’s. Founded in 1987, Nando’s operates in about 1,000 outlets in 30 countries. Now the South Aylesford branch can sit proudly in that family. The restaurant chain has built its offbeat reputation over the past 10 years through a mix of PR and social media efforts that have progressively put the young Britons at the heart of their campaigns. 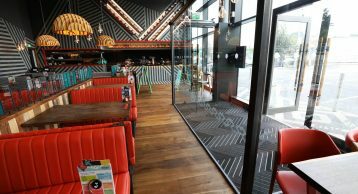 The ‘fast casual’ restaurant, of which Nando’s is perhaps the leading example, is one of the fastest growing sectors in the food industry. It is therefore no surprise that footballers earning £25,000 a week are frequently to be found after training. It is the dining option of choice for EastEnders actors, home-grown rap singers and many more. This popularity has certainly seen a massive increase with around 800,000 people eating at Nando’s in the UK every week! Keeping this influx of people safe at this restaurant is therefore the job of the humble Entrance Matting. Effective Entrance Matting significantly reduces the ingress of soil and moisture, and ensures safe access for every visitor. 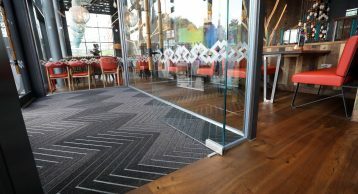 Entrance Matting also made the restaurant a cleaner and dirt-free environment as it forms an effective barrier to foot borne soil and moisture, preventing any damage to floor coverings. 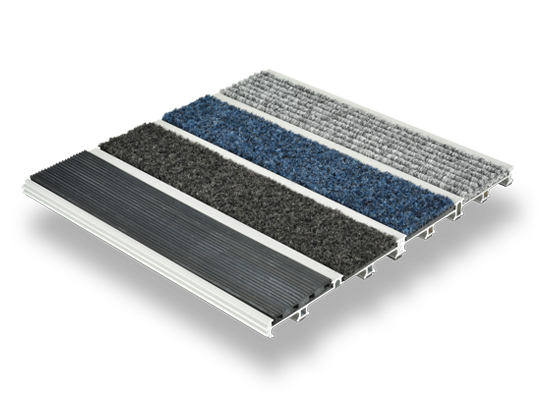 INTRAsystems installed INTRAform Double Module the highest quality entrance matting to effectively remove and retain soil and moisture, and prevent its ingress into a building. They say First impressions last! 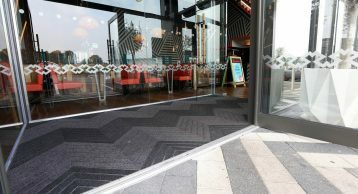 INTRAsystems worked with the restaurant in implementing a very unique herringbone deign of Entrance Matting. 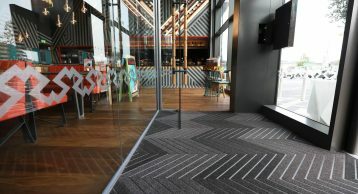 Herringbone designs have become increasingly popular as the go to for flagship aesthetics in carpet, wood and even woven vinyl flooring. 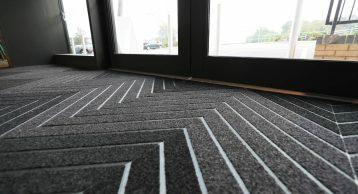 The team here at INTRAsystems have worked hard to get this design implemented in Entrance Matting also. 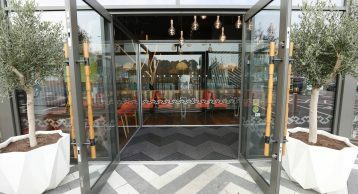 If you need a bespoke Entrance Matting Solution, contact our dedicated sales team on 01425 472000 or email us on info@intramatting.com to see how we can help. You can also see our other projects by clicking here.